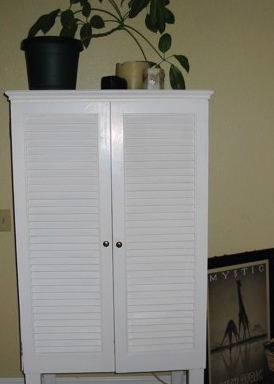 I picked these shutters up at a neighbor’s yard sale then built a simple cabinet out of 2 x 4’s with two inner shelves made of ¾ inch plywood. Bead-board covering the outside adds to a simple country look and I topped it off with a small piece of crown molding to give it a finished look. This was originally used to house my television in the family room and then it migrated to the master bedroom, my daughter’s room and now fashionably houses all of the motor oil, round-up, and washer fluid in my garage.